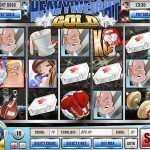 Heavyweight Gold is a 5 reels / 20 paylines slot game released in 2010. The name of the game is pretty clear about what you are going to experience here and it is boxing. If you like to be in the ring or if you just like to watch two professionals fight then this game will be very exciting for you. The Wild in this game is the Boxing Glove symbol which will substitute other symbol to create a winning combination. It can also expand if it will help you form a combination. There are also two scatters here. The first one is the Ring Girl symbol. Landing 3, 4 or 5 anywhere on the reels will reward you with 10, 20 or 100 Free Spins respectively. All that comes with a nice 3x multiplier for your wins during this round. We love this game and the theme! It is very interactive and engaging and even if you’re not a boxing fan you will enjoy it. The bonus features are great and generous and the bonus round is a big favorite! The RTP for this game is at 94%. If you really care about the environment maybe you should consider playing Fixer Upper a 5 reel slot by Rival.